A committee of citizens concerned about the fate of the fisherman statue in downtown Eastport has begun a fundraising campaign. 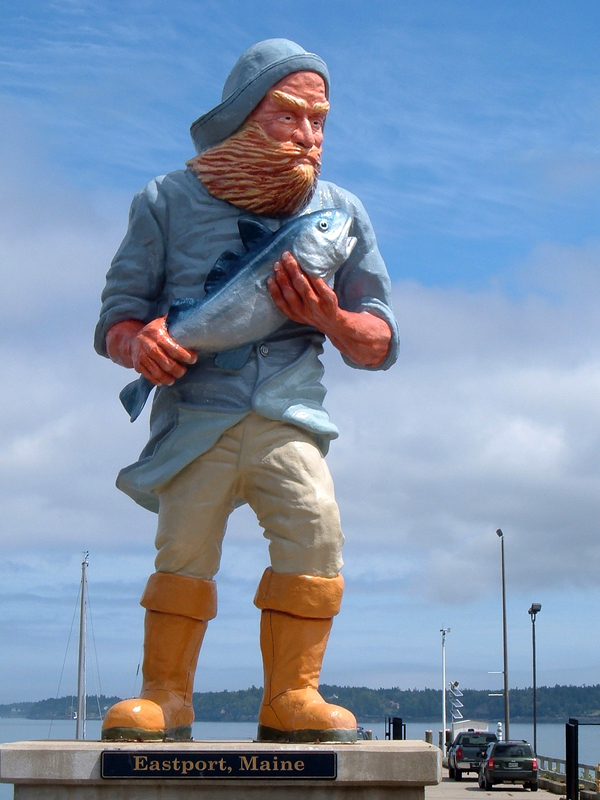 Erected three years ago, the statue quickly became a favorite of tourists, but the colors of the gray-garbed and red-bearded fellow wearing galoshes and carrying a large fish in his arms have dimmed. Its base is deteriorating, and vandals destroyed the lamps that once illuminated him at night. Cook points out that the town has not been maintaining the statue. Not only is sunlight fading the fiberglass statue’s colors, but also water has been getting inside the wooden platform upon which the statue’s metal base is mounted. “It needs polyurethane ultraviolet protection put on the fiberglass,” Cook says. The fisherman is the work of Jeff Poss and was created for the Fox television series Murder in Small Town X. Although the funding for the statue was cut from the show’s budget, Poss went ahead and made it anyway. The result pleased the show’s producers, but when they left town, they didn’t take the statue. The “Save Our Fisherman” fundraising committee believes $10,000 could provide the statue with a permanent base and be enough to repaint the statue when necessary. Monies could also be used to create an interpretive sign explaining the connection between the statue and the 9/11 attack on the U.S. The $1 million winner of Murder in Small Town X, New York City firefighter, died in the collapse of the World Trade Center towers. The statue “doesn’t fit into the history of the town, and it doesn’t lend substance to the town,” says Edward French, chairman of the city’s. Approval by the board is needed for changes within the local historic district, and the statue is now within the district. “It’s a reminder the TV series was here,” he adds. The “Save Our Fisherman” committee members believe the statue’s current location is favorable, and it should stay put. The “Save Our Fisherman” committee is composed, not only of members of the Eastport Area Chamber of Commerce, but of representatives from Eastport for Pride, the Eastport City Council, business owners and Eastport residents. The public is welcome to attend the committee meetings at the Eastport for Pride office. Call Eleanor Norton at 207-853-2724 or Roland LaVallee at 207-853-2336 for more information. Thanks again for your help. We have now raised nearly $2600.00. In addition, Moose Island Marine is going to supply all the Fiberglass and paint materials needed. Also, two of the businessmen on the main street are willing to pay the flying expenses, room and board for the person who built the statue. He has expressed an interest in coming up to restore it! !